Sevatec has named Vikas Sharma its new chief solutions architect for cloud services, tapping the 20-year industry veteran to lead the company’s cloud architecture design and security services for federal customers. Sharma will join the company’s Innovations Team, or I-Team, and will support federal customers as cloud adoption accelerates throughout the government, Sevatec said. Sharma said he was glad to join a company that has built a reputation for expertise and customer support. Sharma brings over two decades of industry experience to Sevatec, and has worked on enterprise and cloud transformation efforts for major federal agencies including Homeland Security Department Headquarters, U.S. Citizenship and Immigration Services, U.S. Customs and Border Protection, General Services Administration and U.S. Food and Drug Administration. He has expertise in many major cloud platform technologies, including Amazon Web Services, Azure and Google platforms and tool sets, Sevatec said. Sharma joined Sevatec from Varent Inc., where he was chief architect. Sharma is one of several new executives who have joined Sevatec in recent months. 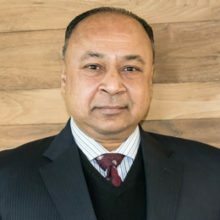 Sevatec recently hired Nawabzada as chief technology officer, and also named a new vice president of business development for the federal civilian practice. WashingtonExec recently spoke with Sevatec founder and CEO Sonny Kakar, who shared some insights on where the government contracting community is heading in 2018. Kakar said the award of GSA’s unrestricted Alliant 2 contract vehicle marks the “beginning of the end of monolithic IT services providers,” and that the government will increasingly turn to small and mid-sized IT businesses to offer innovative solutions to replace “huge and sluggish” legacy IT service organizations. You can find the full interview here.